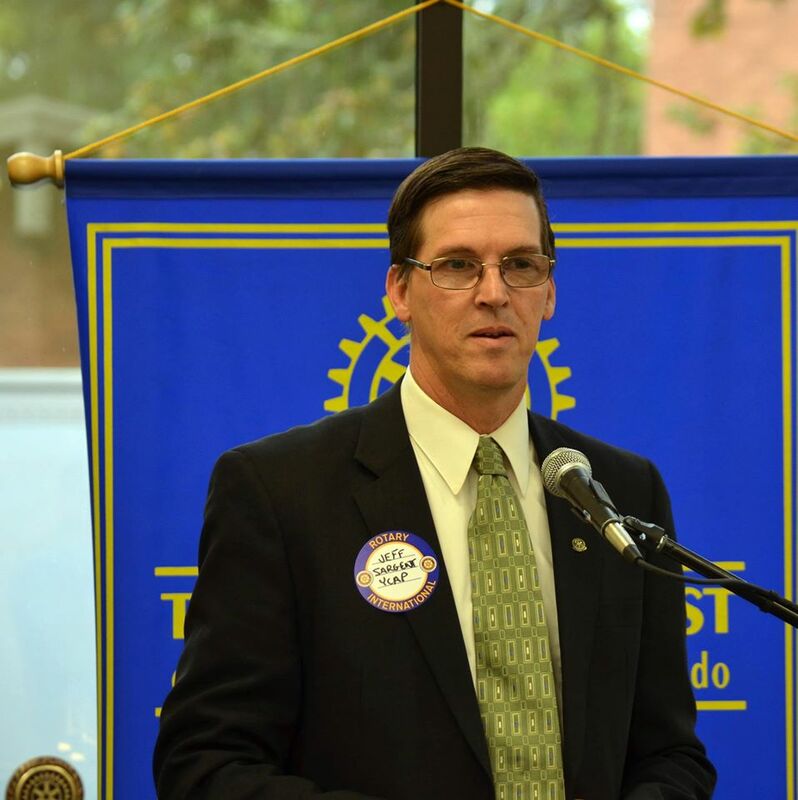 Here’s what happened this week at Rotary…. 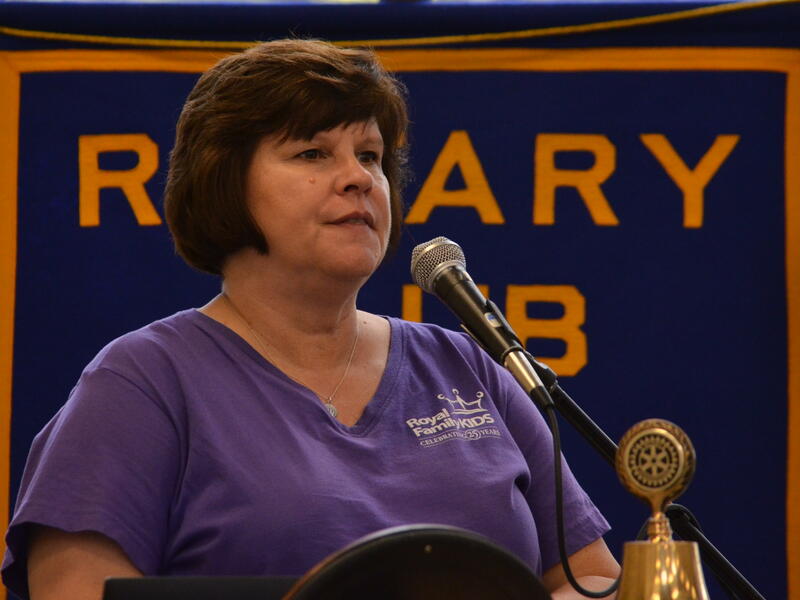 Denise Bacon shared that the NHS Interact Club is starting out strong. She’s got a good crowd of kids who are anxious to have their own service projects as well as work with us on projects. Thanks Geoff Gilmore and Denise Bacon for all your work getting the Interact up and running. Duck, Duck: Geoff Gilmore did the duck and he asked us to all share “Awe Inspiring Moments” It was a great way to start the lunch with ways that Rotary and various life moments have inspired us. We started with Ray Simonsen inspiring us all with his announcement that he is starting his 50th year in Rotary. He’s finishing up 16 Paul Harris Fellows for himself and his extended family. Congrats Ray for inspiring all of us in Rotary Service. This was our annual visit from the Rotary District Governor. President Jim McMaster started with a review of what our club has done including: Pancake Breakfast, Dictionary Project, clean up of Memorial Park, Auction, over $40,000 in scholarships to students, RotoDent, Guatemala trips, upcoming Nepal mission, Peace efforts and Peace Village, Interact Club and many more. District Governor Barb Crozier was introduced by Assistant Governor Tim Strahl. She started by presenting Generator Awards to club members in recognition of their efforts for the club and community. Leah Griffith received an award for her efforts with the newsletter and web site. Ray Hillman was presented an award for his efforts with the Peace Committee and the Cyprus student project. District Governor Barb is actually on her second time around as she was asked to fill in when the scheduled DG had a family tragedy earlier this year. DG Barb stepped up and has really taken on the role again. DG Barb shared a bit of the history of Rotary and its beginning with Paul Harris wanting to encourage ethics in business, which back at the turn of the last century were a bit rare. The first club formed in Chicago and their first service project was a comfort station (public restroom) in Chicago. Rotary clubs have been building restrooms around the world ever since! DG Barb is emphasizing the vocational aspect of service. Ideas are to recognize a local business for ethical standards, do a school ethics discussion, and have a member spotlight where a member shares their business with the club. DB Barb congratulated us on our peace efforts,including Peace Village. 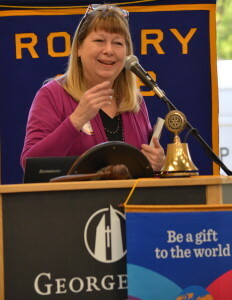 She shared that Rotary has embraced a new branding with the word Rotary more prominent. This has been embraced by our club using it on our web site and our new business cards. She talked about ideas for membership growth such as inviting scholarship awardees parents, youth exchange parents and host parents, inviting speakers to consider membership as well as our interact parents. This in addition to our business and social connections should help us build our club. Another thought is to make sure we send an email thanking our guests for coming and inviting them back. When RI does surveys, people join Rotary to give to the community; they stay for the fun and success of their projects. 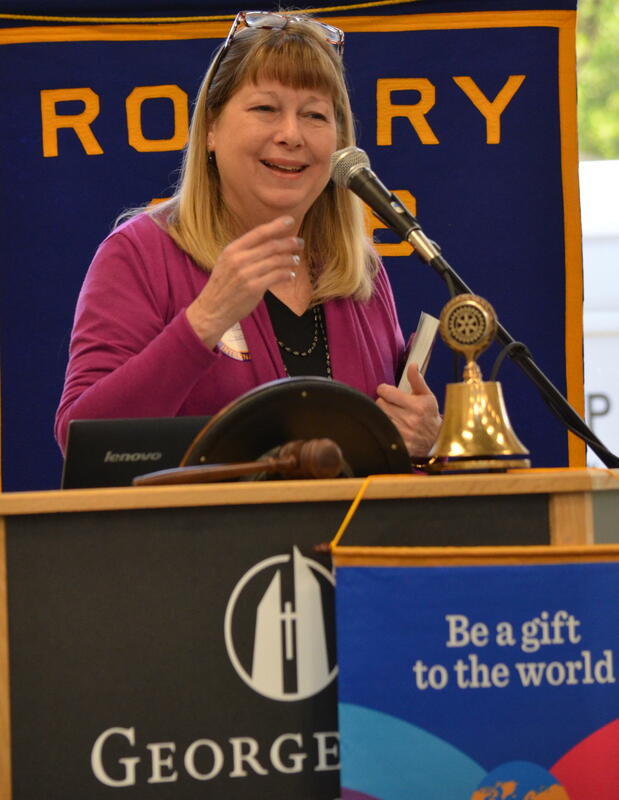 DG Barb reminded us about upcoming Rotary events such as the District Assembly in West Linn and District Conference in Vancouver, both in the spring. 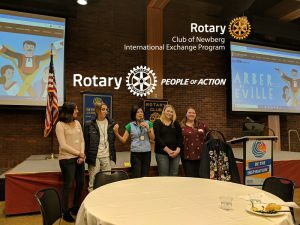 Every Rotarian should consider attending and learning about Rotary beyond Newberg. After the meeting the Board met with DG Barb and talked about some things including the “change” in Rotary where members are encouraged to share their business and professions, not like years before when it was “not allowed”. It was a great visit from our district governor. Auggie was off at a training and we realized we need to have a regular photo sub for him. 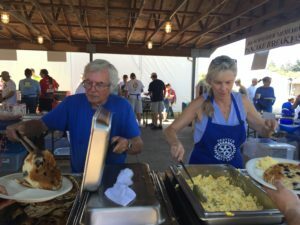 Send news to Leah Griffith, Newsletter Editor at newbergnoonrotary@gmail.com. 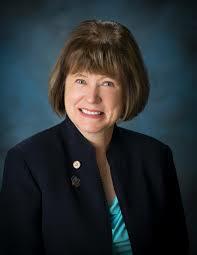 Next week our District Governor Barbara Crozier will be attending our meeting! Please make an extra effort to attend. Did you sign up for the Rotary’s Facebook page. Do it now! 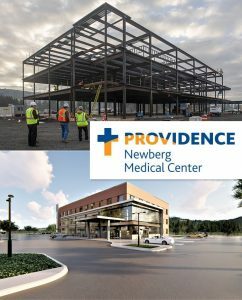 www.facebook.com/Newbergnoonrotary This is a new way to keep up with what’s happening with the club. Habitat Build October 17th– Involves digging and paver placement so bring your muscles. Fish is losing their donations from cardboard– Keep them in mind when you are budgeting your local donations. Joint board meeting will be at Fire Station 21 (Springbrook Station) at 7am. YCAP Light the Fire (hosted by Ruddick/Wood) Nov. 22,2015. More information below. Duck, Duck: It’s a contest! How many grandkids do you have? Debra won with 17 (and she is on her way to meet him!). 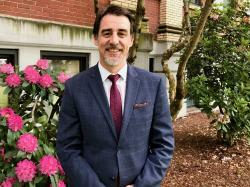 Jeff Sargent, the newest Executive Director of the Yamhill Community Action Partnership (YCAP) dropped by today to fill us all in on the history and future of the organization. CAP agencies were developed in 1964 as part of Johnson’s War on Poverty. Ours was established in 1980 and is one of 18 in Oregon. Energy Service– Emergency assistance, audits, and weatherization. Youth Outreach– For at-risk, homeless, runaway, facing discrimination, and academic issues. Food Bank- 1.25 MM lbs. of food received (from the Oregon Food bank, farmers, grocery stores, and food drives) and distributed in 2015 (in Yamhill County in 30 sites ( pantries, soup kitchens, and group meal sites). 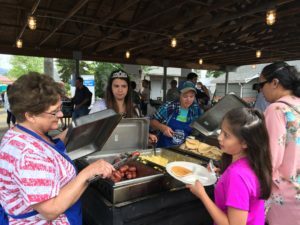 YCAP operates with on a 4.58 Million dollar budget which is made up of Federal, State, and Foundation money, local cash donations, and in-kind donations. In 2015/16 they received a grant from Veterans Services so they are able to offer their services to veterans for the next three years. Grow YCAP’s service capacity to meet the needs of Yamhill County. Expand presence and community engagement. Volunteer– at the food bank, shelter renovations, offer emergancy shelter to youth, join a committee or our board. Wines by: Argyle, Brickhouse, Rex Hill, and Purple Hands. Take Aways– George Fox Art Departent, and a chance to win 3 experiences. Thanks Auggie Gonzales for the photos. Jeff Lane’s wife, Jackie came and spoke to us about her Soroptimist benefit called “Soup’s On”. Soup’s on is benefit for improving the lives of women and girls through programs leading to social and economic empowerment. They are looking for 10 chefs in cook up a batch of soup for a tasting on October 24th at 5pm. They are also looking for auction items. Tickets to the tasting are 25.00. Spike Sumner introduced Shirley Turner from Royal Family Kids. 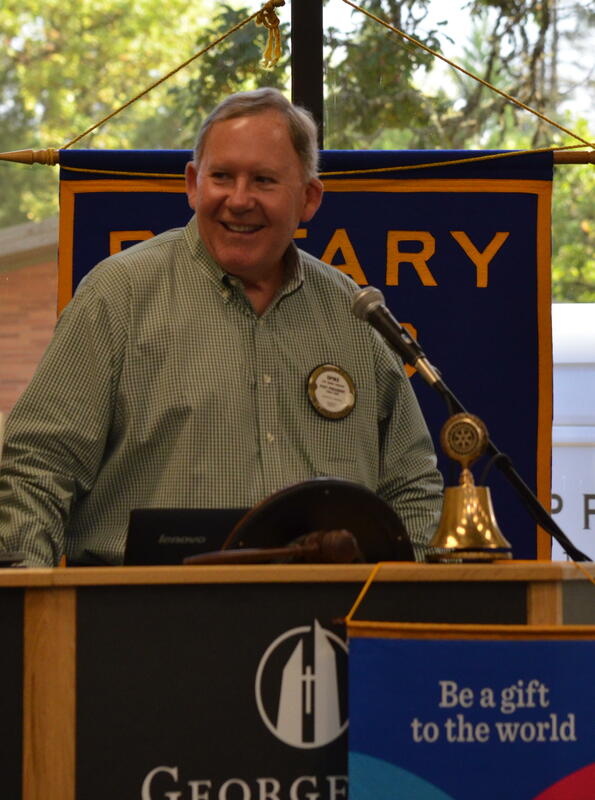 The Newberg Noon Rotary Foundation has been supporting this program for 10 years. They offer a no cost camp for foster kids in Yamhill County. Yamhill County DHS works with Royal Family Kids to identify kids for the camp. These kids are from foster homes. Some have been abused or even may have fetal alcohol syndrome. A lot of them have been bounced around from one foster home to another. These kids have had no one to show them what healthy looks like. There are 2 age groups for the camps. A coed 7-11 group attends fora 5 day overnight camp in late July and a 3 day separate gender overnight camp for the first 2 weekends in August. Camps have a 2:1 camp to counselor staffing. This includes the onsite behavioral specialist. Every kid gets a home made quilt and a pair of shoes to take home. Since birthdays are often forgotten,everyone has their birthday celebrated. Some kids even learn to ride a bike and everyone gets to ride a bike while there. Activities that boys may participate in are paintball, hiking, building a boat and a water gun fight. The girls learn how to sew and participate in a “Glam Night”. Activities also include fishing, electronics and wood working. The kids who attend the camp often ask why the staff is helping and why the staff is so nice to them. They think that the staff are getting paid when they are all volunteers.